In writing, there’s the adage never to share a work in progress. One could say it’s because everyone’s a critic, and the idea is to insulate the sensitive creative mind from undue outside influence. It’s the artist as genius argument. Another way to look at it is the more cynical view of the writer hiding the influence of the editor. Take Raymond Carver for example. When the true role of his friend and editor, Gordon Lish, came out, something shocking became apparent. That brilliantly stark, concise, potent style of his was the result of significant editing, sometimes up to 70%. This laid bare something that I see regularly in my day job: creativity is often best realized through collaboration. In a sense, it is a conversation with an output in mind. Graphic designer Roberto de Vicq de Cumptich in his Design Matters interview, distinguishes art and design sort of along those lines: art is something done for yourself by yourself, while design is done with others for others. But how different are they really? I have come to think of art as a long beautiful conversation that spans generations and civilizations. Wouldn’t it be nice to some day be able to move that conversation, even slightly? All of that was a way for me to lead into saying it is both awkward and exciting to share something in progress. It’s a micro-level engagement in the long conversation with friends. 1. 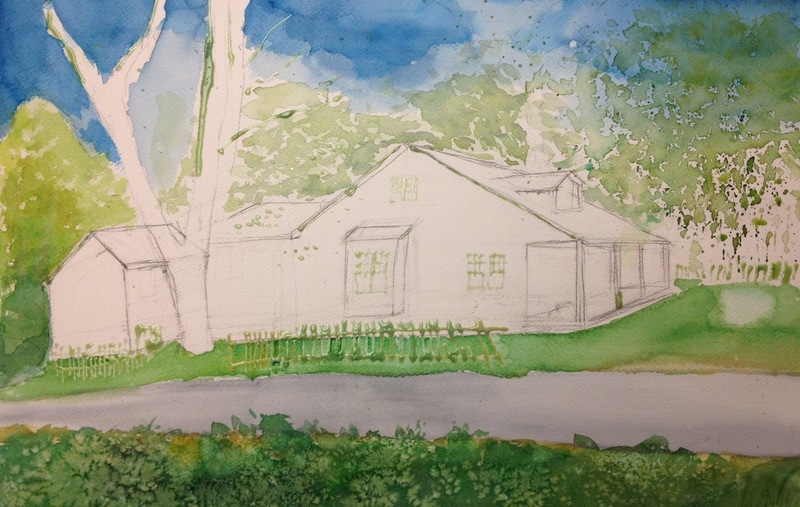 Adding Prussian Blue over the Phthalo blue in the sky to give it more character. 2. Adding a wet haphazard mix of Pthalo Green (PG7), Primary Red Magenta, and Permanent Yellow Deep to the foliage in front, then salting it. 3. Masking out the fence and window panes, as well as some while I wanted to retain in the trees. 4. Washing in the lawn, and blotting out a place for the tree on the right. 5. Fixing the drawing in a few places. I decided not to get too carried away, and just let whatever happens happen when I paint. 6. Splattering and dabbing in the base layer for more pronounced leaves. That’s it for tonight as I let things dry. I think I will save the house details for last, so tomorrow is likely to be defining the trunks, branches, and leaves more fully.